No more English class – what will we do with our days? Woke at the regular time but it felt like it was much earlier. I really wanted to go back to sleep but it was no use. So instead I got up and posted my journal and some pictures. As I was reading in the D&C I got to the section – 134 I think but I am too lazy to get up and look – about the relationship between government and the church. I was struck at how powerful the thoughts were and how strong a country would be that had the type of government that was outlined there. They could certainly use it here in Indonesia. We read 3 pages from the Kitab Mormon, but the last 3/4 of a page caused us lots of problems. When we read the passage from the Book of Mormon we understood why. It did not make a lot of sense there either. It reasonable that that something that was written in whatever language the original plates were written in, and then abridged into whatever language Mormon used, and then translated into early 19th century English and then translated into Indonesian – might lose something in translation. We had a busy morning and a very quiet afternoon and evening. Sam picked us up at 9 – it was good to have him back – and took us to the office. We worked on cleaning up the piles of paper that we accumulated over the last 30 days. Mainly things we used in our lessons. While Mary worked on that I spent most of my time making review sentences for the vocabulary lessons. As we worked people started to arrive for the big missionary reunion-goodbye party for the Jensens. The Kanes arrived and they had the books we asked for. They are really nice and I think the couples will find them useful in teaching English. I gave him Steve’s book and asked him to have 10 copies made so that I can give them to different people. I am going to have it translated into Indonesian so the District specialists can share the information with those who have or are thinking of opening a small business. They had a nice – if a little long – program featuring Indonesian saints that gave tribute and then a video production that alternated between leaders he worked with here and his family back home. Since much of it was in Indonesian – which I could not follow – and the rest in English – which most of the Indonesians could not follow, some parts of the audience were always in the dark. After the program there was food and talking. We told the Jensen’s goodbye for what may have been the last time and had Sam drive us home. The rest of the day and night was spent napping, eating, and watching some TV. A visit to Cindy’s blog turned up an interesting post that led to another blog that told about an experience that Tyler had at ALA involving famous authors. At 8 we read from the Kitab Mormon for an hour – we hit Jesus quoting Isaiah and as usual this slowed us way down. Great may be the words of Isaiah but they are darn hard to translate into Indonesian and then back into English. After that it was time to head for bed and some of the D&C before turning off the lights. This entry was posted in Mission - Indonesia on June 30, 2007 by Bill. The before and after pictures from the hare-lip repair project the Church financed. What a difference this will make to this child as he or she grows up. I did not wake until almost 5 – I was sure it was more like 3 – and so I felt very good. As I ate my breakfast, I continued my reading from the D&C this morning. But first I wrote some comments about some of what I read. The verse that really hit me was D&C 124:15 which was written to Hyrum Smith as he was called to be Patriarch of the Church. The Lord says “For I the Lord, love him because of the integrity of his heart, and because he loveth that which is right before me.” How wonderful it the Lord could say that about me and all of my family. “He loveth that which is right before me.” It reminds me of the passage from the Book of Mormon where the Lord gives Nephi unlimited power to do what he would because the Lord knows he will do nothing that is not right before Him. We read three pages from the Kitab Mormon. Jesus has finished His sermon at the temple and is about to leave when he notices that the multitude does not want Him to go. He is touched and heals the sick and blesses the little children. He is so touched by the faith of the people that He weeps. No wonder it says that it could not be written. How do you write about something like that. Joseph has the same problem writing about the First Vision…no words can express the feeling. How do you explain the taste of salt to someone who has never tasted salt? Agus picked us up and we had not problems making it to the chapel. A little later I walked into the classroom and saw the four empty seats sitting there, I got a lump in my throat. It reminded me that there were only four left and that by the end of the day those would be gone. Mary taught all the morning. I did paper work and cleaned up. I made a number of visits to class and listen to them talk and learn. I did not teach at all. Mary let them out early for lunch – she had run out of things to teach. Jin-young and Anna went to the mall to try and find someplace new to eat but ended back at KFC…which is about all Jin-young has eaten for the month. Since they came back at 1:30 instead of 2:00, Mary taught them until the Peterson’s came. While she was teaching I got a strange call from the Christensen’s in Hong Kong telling me that a branch president would be calling me about a problem he had. Later he called and the short of it is that there is a couple in Hong Kong that wants to come to Indonesia, they have no money and no skills and he wanted to know if I could find them a job – and to top it off the young man in not LDS and does not speak Indoneisan.. I told him straight out the chances of finding them jobs were very slim and even if we could it would not be enough to live on. Lucky for us it really is a problem for the English Branch president because the only language they seem to share is English. The traffic was terrible and Agus showed up an hour late and Lukito almost two hours late. We started our meeting with Agus and had covered most of it when it was time for the English class to end. We went in and gave them a last minute pep-talked and said goodbye. It was not as hard as I thought but I think it will catch up with me tomorrow. We then went back and finished our meeting. The students left to go to president Smith’s house for their last activity in Jakarta. We quickly wrapped up the meeting and we went out to catch a taxi. Since there did not seem to be any coming down our side of the street, we crossed over to the other side. This was the first time we have walked across 6 to 8 lanes of traffic. But the Lord blessed us and there were two nice clear spaces for us to walk across. We had no sooner got there when a taxi pulled up and took us home. It was almost too easy. Once we were home we settled in to our Friday date night mode. Pizza and a movie. Of course in the middle of the movie the lights went out again. That is at least once a day for the last three days. We have no idea of why and management has not sent anything around to tell us. The movie is one about a young man who is plucked out of obscurity and becomes a professional English football player. I received a nice letter from Steve Gibson giving me permission to copy his 25 rules book. He and Betty are going to Hawaii to teach at BYUH – I miss joking with him. I will make copies for all the couples to use to help their members. Also during the day we got the Kane’s weekly update. There were ‘after’ pictures of some of the hare-lip children. What an amazing difference. They can now grow up with a more normal life. We read four pages from the Kitab Mormon – easy stuff but still it is great to read that many. After that it was time to read from the D&C for a short time before turning off the lights. This entry was posted in Mission - Indonesia on June 29, 2007 by Bill. The Van Dongans went home today. They are a wonderful couple who completely changes a branch in the time they were here. They doubled the sacrament meeting attendance by going out and bringing in the less active. They created a branch choir that included almost every member of the branch. They beautified the chapel grounds and taught the members to have pride in them. Yet at one time they sent a letter to the president saying that they did not think they were doing any good in the branch and their mission. The other picture is the Indonesian version of a stretch limo…this is the only one I have seen here. P-Day – or something like it. I woke fairly early and studied Indonesian for about an hour. There is just so much to learn – hopefully whatever years I have left will be used in learning more. I just wish I had spent more time studying the Gospel when I was younger. Of course teaching Gospel Doctrine for 20 years or so caused me to do a lot of reading and some pondering, but here I feel I am getting into the scriptures in a different way. We read from the Kitab Mormon before heading off to the church. It had been raining all morning and so we got to go through some really big stretches of water. This of course slows everything down – something that is hardly needed in Jakarta. Because of the rain I had Agus drop us off and then go pick up the rest of the students. Even then they were late because Anna slept in and had not showered. We had some really good classes today. Mary had them doing work from the black book and I had them work on vocabulary. As usual Vita was way ahead of everyone else. She is the only one who gets through all the exercises and at most she misses two words. Agus is doing better. Jin-young does not do well at first but she must study at night or in the morning because she seems to remember many of the earlier words. The time went by quickly – of course there was only about 3 hours of class because it is their P-day. After the last exercise, I gave Vita a big hug – not really allowed by mission rules but I decided that with Mary and the rest of the class there it was OK – and said goodbye. Hopefully we will see her again and she will decide to continue her education. We decided to ask her to take the Michigan test so we can see how she does after her training. It will give us some idea as to what we need to teach. It turns out that Anna took the Michigan test a couple of times but never scored above 540. It will be interesting to see how Vita does. We sent her home with a stack of vocabulary exercises – she will probably have them done before the train gets back to Yoja. We locked up the church and Agus, Anna, and the two of us headed off to SoGo for some shopping. The traffic was terrible – the rain and lots of cars makes for a big mess. It took us an hour to make a trip that usually takes 20 – 25 minutes. But we had a good chance to talk to Agus and Anna along the way. They told us that Jin-young’s mother wanted her to quit – in fact she went home at one point to take a shower and have some food. But Jin-young said that she wanted to stick it out. According to the other students her mother did a lot of crying because of the conditions she was living. But I think Jin-young has learned something more than just English. She has become close friends with some Indonesians and sees how some of them live. We finally made it to SoGo and quickly got our shopping done. Mary found beef stroganof mix and quickly bought every package they had. We have found that some things you just buy when you can and put it away until you need it because when you need it, it will not be available. We of course also filled up with BreadTalk. The drive home was a little longer than usual but it was certainly faster than it was going. Agus dropped us off and then took Anna home. Later he is going to take Vita to the train station and Eko to buy his ticket home. The rest of them will be going home either Saturday or Sunday. It will be rather sad to come on Tuesday and not have any class to teach. Hopefully Jin-young will take us up on coming in for one-on-one tutoring. We got home in time to put away the groceries and clean up the apartment before the cleaning lady came. We both ended up taking naps while she was here. She is so quiet that we never even know she is here. If she did not knock to get in and ask for her pay when she goes, she could be a ghost. We read the Kitab Mormon for another hour – 3 pages this time. Then we had some tomato soup and fresh bread for dinner. I mentioned to Mary that we were eating an American brand of tomato soup, that is made in Malaysia, in an apartment in Jakarta. And I must say that if the can did not say where it was made, I would not have known it was not from the US. After dinner Mary is doing cross-stitching while I catch up this journal. We could not find anything to watch on TV – at least nothing I wanted to watch. Mary ended up watching something called ‘Racing Stripes’ – and talking animal movie. We got a nice letter from President Gordon Creer to give us his new e-mail address. He is about to leave for Northern Ireland for three years. He and Janice will do a wonderful job there. Maybe we will join them after we have some time at home. If we wait 6 months to go again, We would be released about the same time. I wrote him back and wished him well. I had written to President Smith of the English branch about the possibilities of getting contacts at the US embassy. Later I got a letter from brother Miller – one of his counselors suggesting preparing a form that ex-pats could fill out that would give resources and other information about their companies and who to contact. I would like to meet with the HR directors from the different companies and see what kind of workers they are looking for. We also got an e-mail from Cindy saying they all got home safely and that they had a good time in Washington and the librarians convention. That about wraps up the day. The power just went off and then came back on. This has become a regular problem here. The management has not sent any information of about why. Anyway I am going to bed and read from the D&C before turning off the lights. This entry was posted in Mission - Indonesia on June 28, 2007 by Bill. Everyone should get a kick from this one. 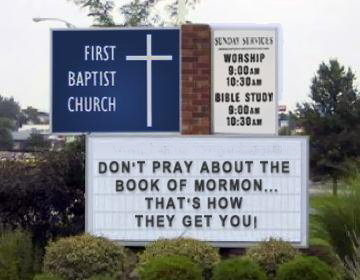 Even the Baptists know the Book of Mormon is true. Actually I was an ‘inactive’ Baptist when I took the lessons 50 years ago. Not much to write about today. We did not get going this morning so we did not read from the Kitab Mormon before Agus picked us up to go to the church. This was our first day with a reduced class. Mary taught most of the time – infact I only taught for a few minutes. However I was not just sitting around. I spent most of my time developing vocabulary word exercises. I also looked for work opportunities for Eko – he does not seem too excited about getting a job in his field. He acts like there are no jobs but it seems that there are if you have enough experience. I think all of the students are ready for this to end. I mean they are getting trunky. Not that they are not trying but it is not the same as it was a week ago. Vita continues to shine, but she is even not as excited to do too much. When the afternoon class ended, Agus drove us home and then took the class to Joel’s for their last night of fun. Vita will go home tomorrow, and the rest will go home sometime Saturday or Sunday – we will have a little problem with where they will sleep on Saturday and Sunday night. We did not read from the Kitab Mormon at all today. This was the first time that has happened in months. We will need to read a lot on Thursday to make up. I did read a few sections of the D&C. I am up to the dedication of the Kirtland temple. I woke much too early today – I can not keep from thinking about the English class and other things. Even some thoughts about home crept in – something that I try to avoid. I just have to leave it up to those who are there to take care of things and trust that the Lord will guide them to do that which is right. We read from the Kitab Mormon this morning. Continuing in 3 Nephi. We were surprised at how hard it was to translate the Sermon on the Mount section – we thought it would be easy but it was not. Some mornings it seems that we have not made any progress in learning the language. I know I could be doing more. It was a busy day for us. We had morning and afternoon classes. Mary taught most of the time but I came in for vocabulary hour. The next time we do this we will start vocabulary on the first day and it will continue for everyday thereafter. At about 3:30 we left for the mission office to have dinner and say goodbye to the Jensens and the Van Dongans. We got there early enough that I had some time to talk to Elder Subandriyo about the class. I asked him if he could remember why he told me the story about the senior missionary teaching the young man to pass the Michigan test. He not only could not tell me why, he could not even remember telling me the story. Isn’t it interesting how often the Lord works that way. It reminded me of how we ‘accidently’ got called to be full time at the TRC. Or how we even ended up here in Jakarta at all – president Jensen changed his mind at least twice as to where we should serve. We had a short talk with the president Jensen. He asked about the English program and about the students. I had written him that one of the students did not seem to be working at it very hard. When we told him who, he was not surprised. He said that he had been that way while on his mission. Up and down in his effectiveness. He gave us some guidance about what we could do in working with the branches to strengthen them. We are determined not to spend so much time in the office. We had a good meal of Mexican food with lots of good discussion. There were a husband and wife who were NGOs from Bogor. They came with the Kanes but knew the Jensens. Also the Petersons, the Van Dongans, and us. After the meal we sat and talked for a short time and then Sister Peterson gave the Jensen’s a nice book of rememberance that included pictures and statements from all of the couples who are presently serving. They in return gave us all a photo and a nice letter that basically said goodbye. We had to leave early so we could get to our graduation ceremony. The Van Dongans hitched a ride with us and that was good because they were 2 or only 4 outsiders who were there. Mary conducted, each of the students gave a short talk, I gave a short talk, we handed out the certificates and then ate. Sister Park – she and her husband were the other guests – fixed food for them. Sam was in 7th heaven because she fixed her great sushi. After eating Sam took us home and then the Van Dongans to the Harris Hotel before going back and making sure everything was cleaned up and locked up. We will miss him for the next three days, but we do have Agus to drive us. By the time we got home we were beat, so we watched an hour of TV and headed off to bed. It was a good day with a number of very spiritual moments. I forgot to mention we had a little scare today. While I was teaching, Mary started to feel very tired so she went and laid down on the couch in the foyer. As she was on the couch she got a terrible cramp in her stomach and thought at first she had food poisoning. However it went away and she was fine the rest of the day. When the president heard this he said that he had some stomach problems over the last few days. I told him that hopefully he would not be taking a serious illness home with him. A very normal morning for us. We read from the Kitab Mormon – we are into 3rd Nephi and the signs at the time of Christs death and resurrection. I am also reading the D&C – I am somewhere in the 80s. The struggle of the saints, the growing establishment of doctrine and the continual sending out of missionaries fill the pages. What a shame that John Whitmer did not keep a really good history of the early church. Or that there was not one person in Kirtland and one in Missouri who kept a daily diary. Joseph later would mention that this lack of a good record of the growth of the church was a great loss. At the church, Mary started the class with a reading test. While she was doing this I sent out a number of e-mails trying to Johan Salim some interviews for a job. Hopefully by the 12th there will be something arranged for him. I sent the following letter to Elder Subandriyo – I include it because it lays out some of the experience we gained through this class. The graduation has been moved back to 7:30 on Tuesday night. If you can be here that would be great. We have learned a lot from this pilot and we would like to do it again in either September or October – perferably September. This would give us a chance to give more returned missionarie a chance to participate. We would certainly be better organized – that is we have a much better idea of what needs to be taught and when to get the best results. An added bonus of this class was that some members – especially those who helped teach or had the young people over to their homes – of the English branch have come to relaize that they can do more to help the Indonesian saints. Sister Guttormsen mentioned bringing a young man or woman into their home for a month and teaching them one on one. I believe others might do the same. So even if we never hold another class – but I hope we do – we might be able to help return missionaries get into BYUHawaii. The program also has made the English branch members more responsive to helping with employment opportunities. I have sent Johan Salims resume to a couple of the members and asked them to see if there are any openings in their companies or if not would they pass it on to those they know in other companies. So I believe the class was worth the effort and the expense. Thank you so much for your support. After an hour, Mary and Sam went to the store to get some things we need for graduation, some thank you notes for the students to send to those who helped. Sam is working on a slide show presentation that we will also give to everyone who helped and to the students. He really is good at this and might find that he could go into business making slide shows and powerpoint presentations. I sat with the class for an hour as they took another test. This will be the final one for them and we will compare it with the first test to see how they did. After lunch Mary went back to teaching and then I joined her for an hour or so. We worked on correcting sentences – something they really do not like to do but really need to learn. They have lots of trouble writing and speaking in correct sentences. I told them not to complain too much about English and went through some of the things we have trouble with in learning Indonesian – like why use ‘pun’ or ‘yang’ in certain situations. After class Sam brought us home where we spent the rest of the day taking a nap, watching some TV, and reading the Kitab Mormon. Mary made up graduation certificates. We gave up on finding an on line certificate that would work and so I started to create one in Word Perfect. Once I got it started Mary took over and did a great job – much better than I would have done – creating a great looking certificate. We got some good news. The dinner for the Jensens will be held at the mission home instead of Amigos. This means we do not have to travel so far and therefore can stay a little longer before we have to leave and head back to the chapel for the graduation program. We do not think many people will show up for it, but it does not matter. What is important is the young people feel as special as they are. I imagine Jin-young’s parents will be there and hopefully Elder Subandriyo will make it. Anyway as I wrote to president Jensen today…the work is true and it is no sacrifice to serve a mission. In fact there are blessings each day while on a mission. 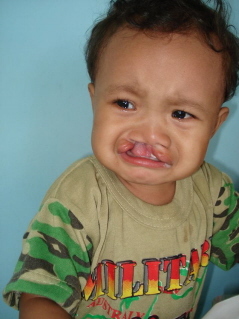 This entry was posted in Mission - Indonesia on June 25, 2007 by Bill. I woke at 4:30 – I guess this is my new wake up time – and read from the Doctrine and Covenants. We did not read the Kitab Mormon – which means we will read twice later in the day. We went to the English branch so we could hear our students give their talks. It is good to sit in Church and to be able to understand what is said – not only spiritually but also verbally. They did fine – I wish Jin-young could have spoken louder or had put the mike down further but all in all it was good. I think Anna did the best and when she got to the point of bearing her testimony she could not keep back her tears. Elder Thomas gave a very good talk on faith with some stories from his past that helped illustrate his points. Brother Tandiman was the concluding speaker and I have to say that he was not at his best. However he mentioned that 23 years ago he met a man on the streets of Yogja and baptized him and his family – it was Anna’s father. What is the chances of two Indonesian natives sitting next to each other on the stand in an English branch and having that history. The Lord works in mysterious ways. Sunday School was great – we talked about J.S. Matthew 24 and I spoke up a few times. I was surprised how seldom any of the sisters joined in but Joel, myself and brother Moore all got in our comments. At first I did not find the PH lesson on prayer engaging me but as it went along I found myself thinking about my own prayers and how I needed to pray more often and try to get spirit to be there. I need to humble myself and approach the Lord with a truly broken heart and contrite spirit. We were home by 11:30 – we took a cab home – and have spent the day reading the Kitab Mormon, the D&C, and watching DVD movies. We had a rather interesting day with the electricity. It went off a couple of times and although most things eventually came back on, the cable system did not. Luckily the computer has a battery so it never crashed. Two appliances we really miss are the clothes dryer and dishwasher. The days are starting to blurr a little. I had to stop and think what day of the week it was. I guess it is because almost every day this month all that we have thought about is the class. Just this morning I realized that I had not called Lukito to find out how the SEW went last Saturday or to find out if there would be a CW at Jakarta Raya today. I woke at about 5:00 and started reading the D&C but in the middle of D&C 56 I went back to sleep for a few minutes. Since I was reading 56:14 at the time, I have wondered if this was written to me – I am afraid I am a great one for trying “counsel in my own way.” I am really enjoying reading the D&C – I have not done this in a long time. We read from the Kitab Mormon – we have made it to just before Christ is crucified. We continue to run across words we either have not had or more likely we have forgotten. Just yesterday I realized that every time we read from the Kitab Mormon my voice gets hoarse. Pronouncing the Indonesian words must stress my vocal cords. It is strange that I never realized this before. I have always thought that Indonesians say many of their words in their throats as much as with their mouths – that is why they hardly ever really open their mouths very wide when they are speaking. Also they roll their r’s which is strange to us. We had a good day of classes. Mary took most of them – at least the morning classes. I continued to work on the vocabulary – it is not easy to do them. I have a much greater respect for those who made up almost 2000 words worth. I took hours to it for just 17 words. We had a client come in today – he had been here before. He has not held a job in 4 years. He went to school for three years to study English but does not want to be an English teacher. He is a cook. Why in the world he took English I do not know but it is the kind of thing we need to work on stopping if at all possible. I had a good talk with Vita. I told her how I had been thinking about her situation. I counseled her that the Lord has given her many talents and we are told to use our talents in the Lord’s work. I told her the Lord knows what she should do and therefore she should fast and pray about going to college – maybe even BYU Hawaii. I told her if she is supposed to go the Lord would prepare a way for her to achieve it. I took Ekjo, Anna and Jin-young and worked on their talks with them. I had them give their talks and then I had them give them again with me videotaping them. We now have all 6 talks on tape. They all did very well and I just hope they will remember to speak up when they give them tomorrow. As we were finishing our class, president and sister Jensen were walking in and right behind them was Elder Kane. It turned out that they were coming for Zone Priesthood Leadership and I should also go. So Mary headed home and I talked with Elder Kane until it was time to go up to the meeting. We had a good talk – they have had a quiet week in their calling but he had good gospel talks with three of the NGOs. I did not learn anything at PH Leadership but I gained a lot. It may seem strange to write that but it is true. The spirit that was there, sharing the meeting with all the Indonesian saints. The only four bulais there were president Jensen, president Smith of the English branch, elder Kane and myself. They gave us a great interpreter who was able to instantly translate for us. President Jensen spoke about the PH and the Oath and Covenant. I guess what made it great was that I was sharing this experience with a group of fellow priesthood holders and although they were speaking a language I could not understand, I could feel their spirit as they spoke. As Sam was taking the students to Joel house for their evening class, I thought I would need to catch a cab home. However I got lucky and ran into Sudein, the Kane’s driver, and asked him if he would give me a ride home. Since elder Kane came with the Lees he was happy to do this. We had a nice talk about his family, his conversion, and how the loss of his business in 1998 was a good thing as it led to him finding the gospel. The Lord does work in mysterious ways. I was hoping that Mary had ordered pizza but when I got home I found she was waiting for me. At first I was disappointed but when it came and was nice and hot, I decided it was worth the wait. After dinner Mary watched a movie and I did some things on the computer before reading from the D&C. It has been a good day – especially in the gifts of the spirit. It is great to serve here in Indonesia – I am sure it is great to serve anywhere – and it does not feel like any kind of sacrifice. I woke at 4:30 but managed to go back to sleep until well after 6. Obviously I am not worrying as much about the English class, mushrooms, or other things to interfere with my sleeping. I am not sure that is a good thing – but at least it is good for my sleeping. We decided – mostly with my prompting – to read the Kitab Mormon at the office instead of at home. In that way I could print some pictures of the Salt Lake Temple in the winter for the students. It is a good thing that I am still working on patience as a Christ like attribute because for some reason the printer would only print half a page of pictures and then stop. After working on the problem for the best part of an hour, Mary suggested that the paper might be too stiff and was getting hung up. So I tried gently pulling on the paper as it came through and that seem to work. At least it worked once, which was all we needed. Today is Tom’s 46th birthday – I tried to think back to my 46th but nothing clicked. Of course since I can not remember anything about my 68th birthday and very little about my 69th – it is not strange that I can not remember earlier ones. In fact the only birthday I can remember is the one where I got smacked in the mouth with a bat – I think I was 8 at the time. We did not teach today, but I was busy for almost 6 hours doing things for the class. Mainly I was writing sentences to help them with vocabulary. I also sent off a few e-mails – the Bennetts and the young man at BYUH. We also read for in the Kitab Mormon for an hour. I think when the class is over and we are in the office, we will try to read for at least an hour. Sister Mary taught the morning class and the Petersons taught the afternoon class. Tonight they will go to president Smith’s house to be taught but mainly to be fed. I am not sure that they learn much when they do not go to Joel’s but I am not sure. I know the next time we will be more organized about the lesson plan. Right after we got home – John, the Petersons’ driver, drove us home so Sam could stay in class – we went down and had haircuts. I like the way this barber does my hair – I am definitely going to keep short after the mission. I spent the next hour reading the D&C. I was especially interested in D&C 46. I do not remember it being so powerful, but maybe I was never ready to hear and feel it’s message. It is about the spirit and the gifts of the spirit. D&C 46:7 says “And that which the spirit testifies unto you even so I would that ye do it.” I wonder how often I am close enough to the Lord to feel the spirit ‘testify’ to me. And if I am do I then do it or do I procrastinate because I am ‘too busy’ with other things that I like to do. Nephi and that boat keep coming to my mind – what would I have done if the Lord had ask me? Probably complained that he must have the wrong man. 46:10-29 contains the great discourse on the Gifts of the Spirit. I especially like 18 and wonder if I will ever be ‘wise and have knowledge’ in the Lord’s eyes. 46:30-33 lays out the way we need to live by the spirit. It came to mind how important is my personal relationship with God and the Savior and to live so I can have the spirit to always be with me. I need to read this section more often. Like the 50th section that is coming up, it emphasis the importance of the spirit in the church and in our lives. I wrote to bishop Pletsch – I have not been very good about writing him. I think this was only the third time in the 6 months we have been on our mission. But then he has only written to us once so I guess I am still ahead of him. We have kept up with some of what has been going on in the ward through letters from others. We just finished doing our second hour of reading the Kitab Mormon. We are in 3 Nephi 7 where the Nephites seem to have broken up into tribes having destroyed the rule of judges that had been started by Mosiah. It was another of those strange mornings when I woke at 3:30 and thought I had not gone back to sleep because I was thinking of so many things. However the next time I looked at the clock it was almost 5:30. It seems that my dreams have become part of my life (I have tried to rephrase that a number of times to make it sound right but nothing does.) A seamless movement from sleep to being awake. We read from the Kitab Mormon – today was easy because most of it was about preparing for wars and fighting. There is so much of that in the book that we have become quite good at translating the words. While we were reading brother Page from the English branch called to confirm that the class was coming to their house for P-day evening. I think the next time we hold this class we will get a lot more help from the English branch. This will be good if we layout a good lesson plan so everyone is on the same page and building on what others have done. Mary said that the Lord provided when he had the branch presidency changed in the English branch – that president Smith had really jumped in and made arrangements for FHE and P-day evenings. We had an easy morning – at least I did. Mary taught for an hour and then gave them the last practice reading test. That took another hour and then we broke into groups for the last hour and worked on vocabulary. Since it is P-day when we were through with the morning classes we were through for the day so we could head out and do some of our errands. We stopped for lunch at KFC – Sam and Mary deserved a good lunch. The place – which in a higher income area – was packed. Not with bulais but with Indonesians who worked somewhere nearby. Since a meal costs about $2.50 – what a laborer will make for 8 – 10 hours of work – not many average Indonesians could afford to eat there. From there we went to the mission office to pick up mail and invite Elder Subandriyo to our graduation exercises on Tuesday evening. Mary is making certificates to give out and hopefully Elder Subandriyo will give a little talk. We had a nice talk with Sister Jensen – she is deep cleaning the residence so the new president and his wife will have a nice clean home to move into. She said that they have not really started everything ready to go – they did ship off their container at the start of the month – but felt they wold move into high gear next week. Our last stop was SoGo where we hit gold. A new shipment of Oscar Meyer franks had come in – we bought 5 packages and never even looked at what they cost. We also got some more hotdog buns so we can have hotdogs on Friday night and pizza on Saturday night. We of course wiped out BreadTalk – I would be 10 pounds lighter if we had not found that place. When we got home Mary remembered that we needed the air-conditioning cleaned. I forgot to mention earlier that when we woke up this morning there was a puddle of water under the bedroom unit. So we called and less then an hour later the crew showed up and for the last 90 minutes they have been busy as bees servicing the units. I am afraid to think about the bill – it would be $250 in the US – hopefully here it will be more like $45. But since we have never had this done before, we do not know. When they leave we will go back to watching Pirates of the Caribbean 3. They put English sub-titles on the DVD – who ever does the translation is terrible and we have to really work hard not to watch them because they are very distracting. Well I was certainly wrong about the cost of getting the air conditioners fixed – it cost $30. That is for 3 men for almost 2 hours and includes recharging one of the units with Freon – yes they still use that here. After they left we went back to Pirates 3 but it was so slow and uninteresting that we decided it was not worth three hours of our lives and turned it off. Instead I read the Church News while Mary worked on some English lessons. The Church News had some good articles – including one about the area around the Finger Lake area and Palmyra. Some of the conversion stories were really good. I also felt that President Monson’s talk to the Argentinian saints was excellent. There was a lot of good counsel that I could use. I think the reason we need to read the scriptures, gospel lessons, church magazines, etc. each day is so we can fortify our spirit against the worldly things that we will face each day – no matter who we are, where we are or what our calling. I really do need to put on the full amour of God – because anything I leave off provides a weakness in my defenses where the world and worldly values can creep in. How often in the D&C does the Lord remind Joseph that he is not doing all that he can, that he has allowed the world to interfere with the work he was called to do. If a prophet can allow that to happen than how much easier is it for me to allow it? We read the Kitab Mormon for an hour – we had to look up lots of words and struggled with some of the grammar – sound like our students. Now we are preparing to call it a day and head for bed.